According to the Drought Monitor, drought conditions worsened slightly across the entire US compared to three weeks ago. As of September 17, 2013, 48.2% of the contiguous US is experiencing moderate or worse drought (D1-D4), as the early 2010s drought continues month after month. This value is about 11 percentage points lower than it was in the early spring. The percentage area experiencing extreme to exceptional drought decreased from 14.8% last month to 6.9% last week! This is more than 10% lower than it was six months ago. The eastern third of the US was wetter than normal during August, which helped keep drought at bay. The east coast in particular was much wetter than normal and the summer monsoon was much more active this summer compared to 2012, assisted by a persistent upper level blocking pattern. Instead of Exceptional drought in the West like there was earlier this summer, record rains and flash flooding was the story in September. While this record-breaking series of events broke the drought in some areas of the West, long-term drought continues to exert its hold over the region. Compared to earlier this summer, drought increased in area and intensity across the Midwest. Figure 1 – US Drought Monitor map of drought conditions as of September 17th. If we compare this week’s maps with previous dates (here and here, for example), we can see recent shifts in drought categories. Compared to mid-August and early September, and despite recent rain events, drought expanded or worsened in the Midwest (Iowa, Missouri, Illinois, Minnesota, and the Dakotas) as well as Louisiana, Arkansas, and Mississippi. On the other hand, alleviation is evident in small places in the West, as the following map shows. 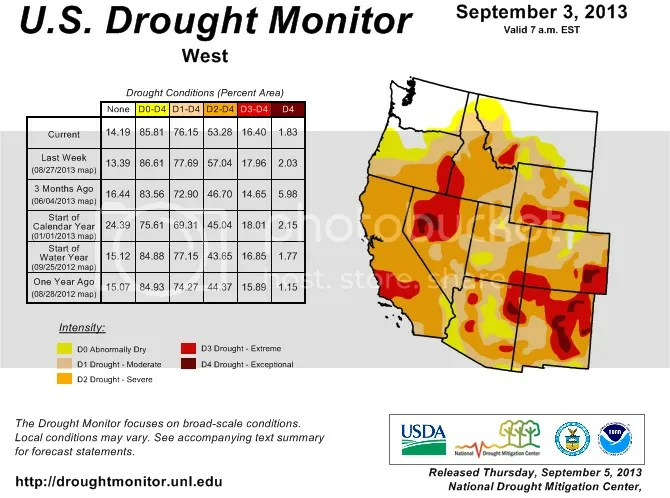 Figure 2 – US Drought Monitor map of drought conditions in Western US as of September 17th. After worsening during late winter into spring 2013, drought conditions steadied in late summer. The differences between this map and early September’s is the reduction in area and severity of drought, especially in the southern half of the West. The area experiencing Exceptional drought decreased significantly over the West and the percent area with no drought increased. Figure 2 also shows that the percent area with no drought is still lower since the start of the calendar year (24% to 18%). Figure 3 – US Drought Monitor map of drought conditions in Colorado as of September 17th. There is evidence of substantial improvement in Colorado since just a few weeks ago and certainly compared to earlier this year, when drought conditions were their worst. Compared to the start of the calendar year or even three months ago, the percent area of every drought category decreased significantly. Only 1.5% of the state currently has Exceptional drought. Only 84% of the state is even experiencing any drought condition today, a far cry from the 100% that lasted for well over one year. The links in the first paragraph dealing with last week’s rains combine with this graphic to demonstrate that places that receive one year’s worth of precipitation in one week’s time bust their drought! Many communities would trade those record rains for a little bit of drought, given the extensive damage to infrastructure and the eight people who, as of this morning, perished in the severe weather event. 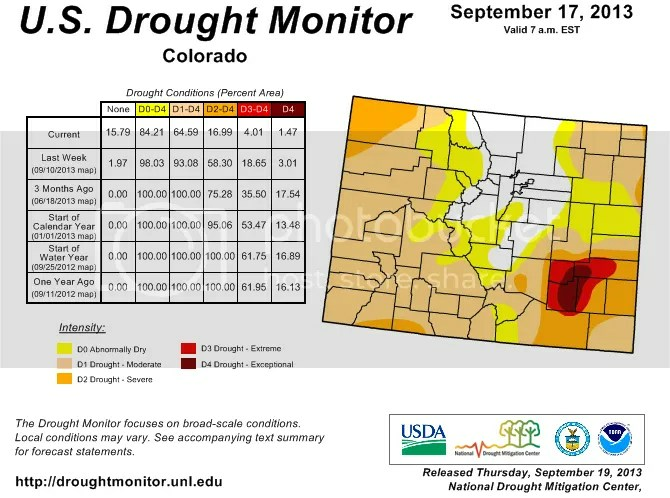 Figure 4 – US Drought Monitor map of drought conditions in Colorado as of September 3rd. The over-active monsoon season helped reduce drought severity from Denver northwest toward the Wyoming border. I said at the time I hoped that trend continued, but I could never imagine what would happen in the interim. 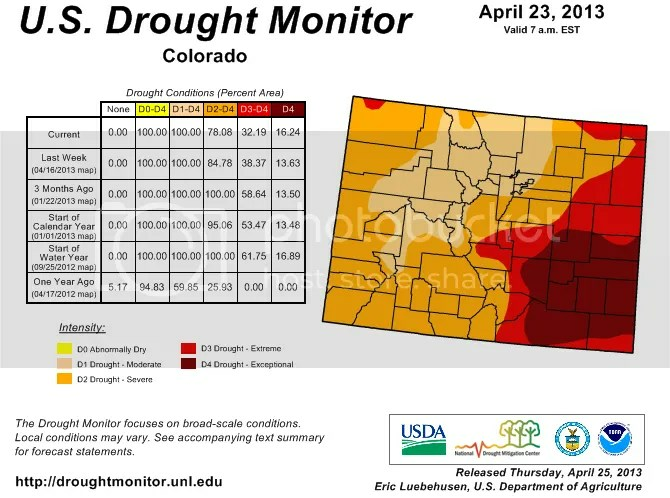 Figure 5 – US Drought Monitor map of drought conditions in Colorado as of April 25th. Conditions were horrible earlier this year. Reservoir levels declined and crops failed as a result of the higher than normal temperatures and much lower than normal precipitation. I certainly don’t want to see additional flooding, but I would like to see normal precipitation return to the state and the region. Figure 6 – US Drought Monitor map of drought conditions in the Midwest as of September 17th. Drought expanded in the Midwest in the past two weeks: the percent area with no drought decreased significantly from 48% to 43%. Three months ago, the value was 93%. This region collected rainfall this month, but the amounts continued to track below average. Figure 7 – US Drought Monitor map of drought conditions in the South as of September 17th. Compared to early summer, drought as a whole expanded across the South in 2013. Instead of 44% area with no drought three months ago, there is only 16% today. US drought conditions are more influenced by Pacific and Atlantic sea surface temperature conditions than the global warming observed to date. Different natural oscillation phases preferentially condition environments for drought. 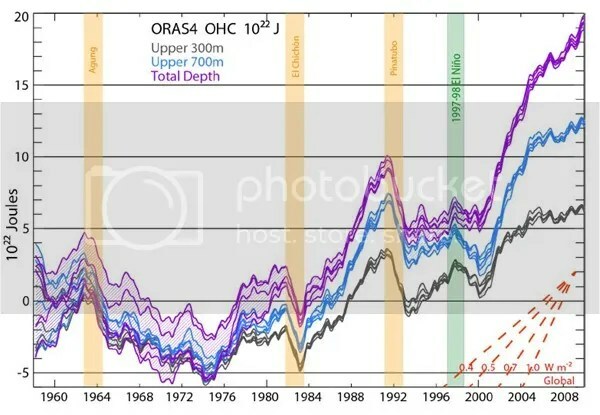 Droughts in the West tend to occur during the cool phases of the Interdecadal Pacific Oscillation and the El Niño-Southern Oscillation, for instance. Beyond that, drought controls remain a significant unknown. Population growth in the West in the 21st century means scientists and policymakers need to better understand what conditions are likeliest to generate multidecadal droughts, as have occurred in the past. Without comprehensive planning, dwindling fresh water supplies will threaten millions of people. That very circumstance is already occurring in western Texas where town wells are going dry. An important factor in those cases is energy companies’ use of well water for natural gas drilling. This presents a dilemma more of us will face in the future: do we want cheap energy or cheap water? In the 21st century, we will not have both options available at the same time as happened in the 20th century. This presents a radical departure from the past. As drought affects regions differentially, our policy responses vary. A growing number of water utilities recognize the need for a proactive mindset with respect to drought impacts. The last thing they want is their reliability to suffer. Americans are privileged in that clean, fresh water flows every time they turn on their tap. Crops continue to show up at their local stores despite terrible conditions in many areas of their own nation (albeit at a higher price, as found this year). Power utilities continue to provide hydroelectric-generated energy. That last point will change in a warming and drying future. Regulations that limit the temperature of water discharged by power plants exist. Generally warmer climate conditions include warmer river and lake water today than what existed 30 years ago. Warmer water going into a plant either means warmer water out or a longer time spent in the plant, which reduces the amount of energy the plant can produce. Alternatively, we can continue to generate the same amount of power if we are willing to sacrifice ecosystems which depend on a very narrow range of water temperatures. As with other facets of climate change, technological innovation can help increase plant efficiency. I think innovation remains our best hope to minimize the number and magnitude of climate change impacts on human and ecological systems. Categories: Uncategorized | Tags: 2012 drought, 2013 drought, climate change, climate policy, drought, extreme drought conditions, extreme weather, multidecadal drought, policy, US Drought Monitor | Permalink. According to the Drought Monitor, drought conditions worsened slightly across the entire US compared to three weeks ago. As of September 3, 2013, 50.1% of the contiguous US is experiencing moderate or worse drought (D1-D4), as the early 2010s drought continues month after month. This value is about 9 percentage points lower than it was in the early spring. The percentage area experiencing extreme to exceptional drought decreased from 14.8% three weeks ago to 9.9% last week; this is approximately 10% lower than it was six months ago. The eastern third of the US was wetter than normal during August, which helped keep drought at bay. The east coast in particular was much wetter than normal and the summer monsoon was much more active this summer compared to 2012. Instead of Exceptional drought in Georgia and Extreme drought in Florida two years ago, there is flash flooding and rare dam water releases in the southeast. Four eastern states experienced their top-four wettest Julys on record. The West presents a different story. Long-term drought continues to exert its hold over the region, as it remained warmer than normal but six southwestern states received top-20 July precipitation this year. Meanwhile, Oregon recorded its driest July on record. Compared to three weeks ago, drought area increased in the Midwest. 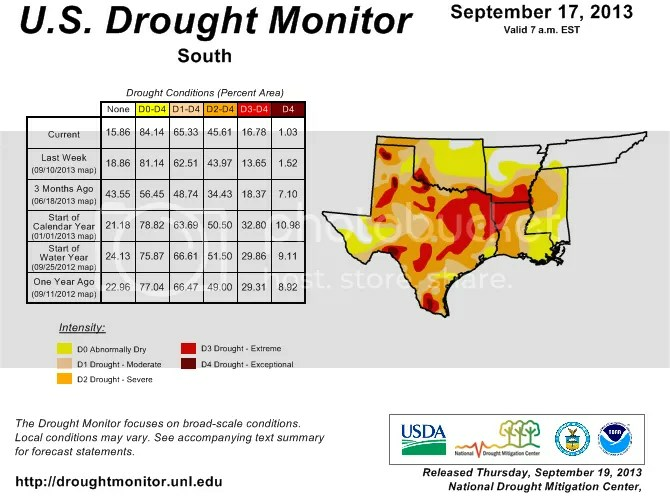 Figure 1 – US Drought Monitor map of drought conditions as of September 3rd. If we compare this week’s maps with previous dates (here and here, for example), we can see recent shifts in drought categories. Compared to early July and mid-August, and despite recent rain events, drought expanded or worsened in the Midwest (Iowa, Missouri, Illinois, Minnesota, and the Dakotas) as well as Louisiana, Arkansas, and Mississippi. 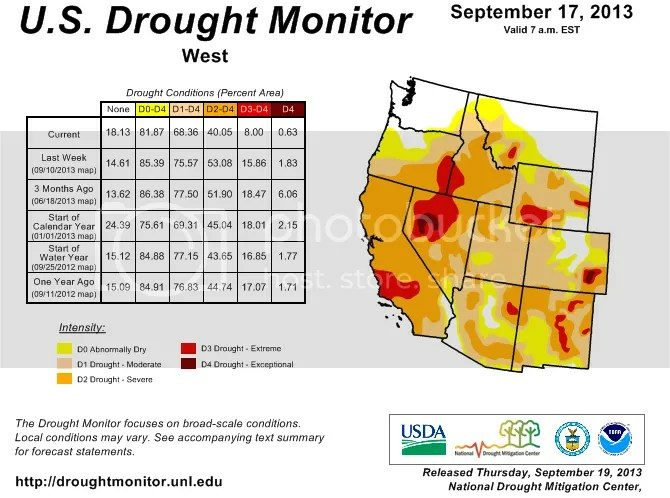 Figure 2 – US Drought Monitor map of drought conditions in Western US as of September 3rd. After worsening during late winter into spring 2013, drought conditions steadied during the past month. The differences between this map and mid-August’s is the spatial shift of conditions; the total percent area values are about the same. The area experiencing Exceptional drought decreased slightly over the West and the percent area with no drought increased slightly, but remains at low levels. Figure 2 also shows that the percent area with no drought decreased since the start of the year (24% to 14%). 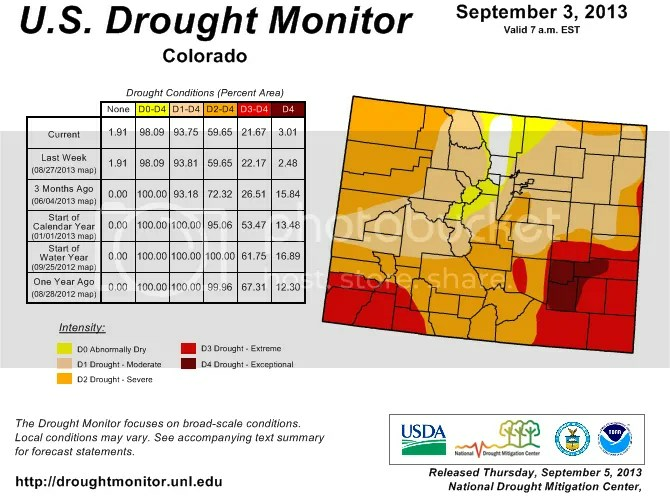 Figure 3 – US Drought Monitor map of drought conditions in Colorado as of September 3rd. There is clear evidence of relief evident over the past three months here. Severe drought area dropped from 72% to 60% (this was 100% about last year!). Extreme drought area dropped from 27% to 22% (also down from 50%+ six months ago). Exceptional drought decreased significantly from three and six months ago. Instead of 16% of Colorado (and as much as 17% earlier this year), Exceptional drought now covers only 3% of the state. The good news for southeastern Colorado was the recent delivery of substantial precipitation. I didn’t think it would be enough to completely alleviate the worst conditions, but they received enough precipitation that drought conditions improved from Exceptional to Extreme. Their drought is not over yet, but they are finally trending in a good direction. And for the first time in over one year, some small percentage (2%; up from 1% three weeks ago) of Colorado does not currently have any drought. This is great news – hopefully this area expands throughout the rest of the year. Figure 4 – US Drought Monitor map of drought conditions in the Midwest as of September 3rd. Drought expanded and worsened slightly in the Midwest in the past few months: the percent area with no drought decreased significantly from 91% to 52%. The percent area with Moderate drought increased significantly from 3% to 29% this week. 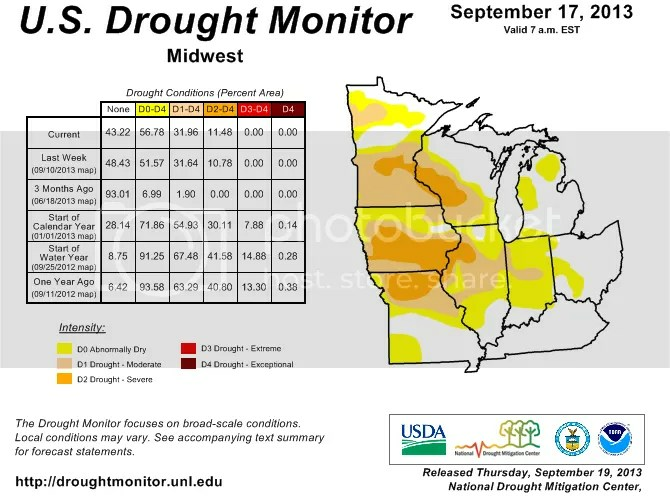 Severe drought now impacts most of Iowa and small portions of Missouri, Wisconsin and Minnesota. Categories: drought, environment, global warming, policy, science | Tags: 2012 drought, 2013 drought, climate change, climate policy, drought, extreme drought conditions, multidecadal drought, policy, US Drought Monitor | Permalink. According to the Drought Monitor, drought conditions improved recently across some of the US. As of Aug 15, 2013, 45.3% of the contiguous US is experiencing moderate or worse drought (D1-D4), as the early 2010s drought continues month after month. This value is about 10 percentage points lower than it was in the early spring. The percentage area experiencing extreme to exceptional drought increased from 14.6% to 14.8%; this is approximately 4% lower than it was six months ago. The eastern third of the US was wetter than normal during July into August, which helped keep drought at bay. The east coast in particular was much wetter than normal and the summer monsoon was much more active this summer compared to 2012. Instead of Exceptional drought in Georgia and Extreme drought in Florida two years ago, there is flash flooding and rare dam water releases in the southeast. Four eastern states experienced their top-four wettest Julys on record. The West presents a different story. Long-term drought continues to exert its hold over the region, as it remained warmer than normal but six southwestern states received top-20 July precipitation this year. Meanwhile, Oregon recorded its driest July on record. Figure 1 – US Drought Monitor map of drought conditions as of August 13th. If we compare this week’s maps with previous dates (here and here, for example), we can see recent shifts in drought categories. Compared to early July, and despite recent rain events, drought expanded in the Midwest (into Iowa, Missouri, Illinois, and Minnesota) as well as Louisiana, Arkansas, and Mississippi. 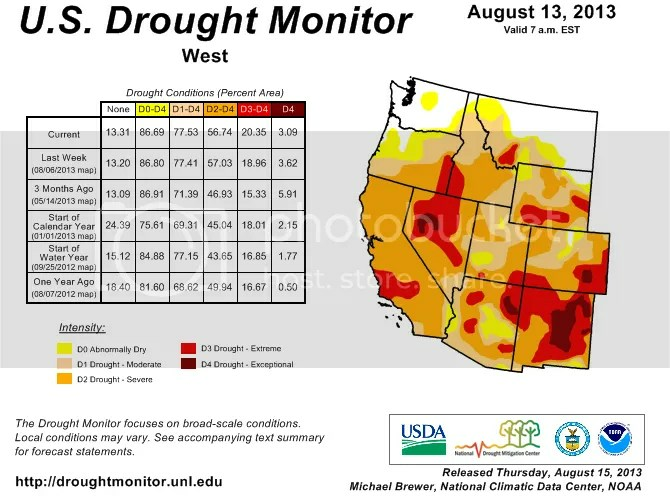 Figure 2 – US Drought Monitor map of drought conditions in Western US as of August 15th. After worsening during late winter into spring 2013, drought conditions steadied during the past month. The differences between this map and early July’s is the spatial shift of conditions; the total percent area values are about the same. Temporary drought relief occurred over parts of Arizona and Colorado as the summer monsoon brought moisture northward and interacted with cooler air masses than normal from Canada. Figure 3 – US Drought Monitor map of drought conditions in Colorado as of July 9th. There is clear evidence of relief evident over the past three months here. Severe drought area dropped from 72% to 69% (this was 100% about six months ago!). Extreme drought area dropped slightly from 27% to 26% (also down from 50%+ six months ago). Exceptional drought is down significantly from three and six months ago. Instead of 17% of Colorado, Exceptional drought now covers only 3% of the state. The good news for southeastern Colorado was the recent delivery of substantial precipitation. I didn’t think it would be enough to alleviate the worst conditions, but they received enough precipitation that drought conditions improved from Exceptional to Extreme. Their drought is not over yet, but they are finally trending in a good direction. And for the first time in over one year, some small percentage (1%) of Colorado does not currently have any drought condition. This is great news – hopefully this area expands throughout the rest of the year. US drought conditions are more influenced by Pacific and Atlantic sea surface temperature conditions than the global warming observed to date. Different natural oscillation phases preferentially condition environments for drought. 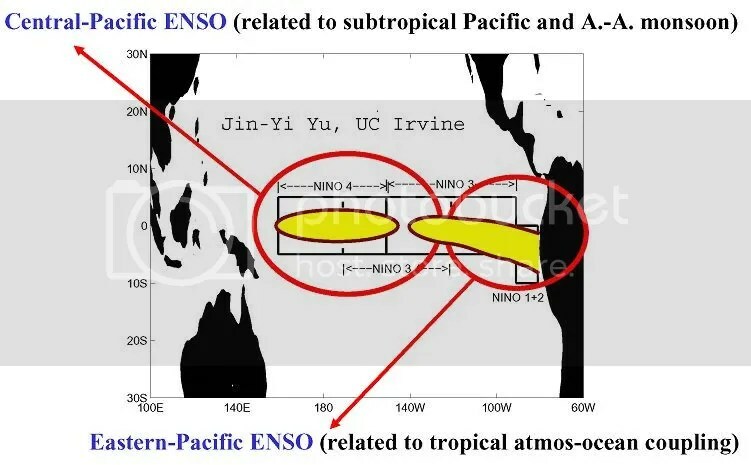 Droughts in the West tend to occur during the cool phases of the Interdecadal Pacific Oscillation and the El Niño-Southern Oscillation, for instance. Beyond that, drought controls remain a significant unknown. Population growth in the West in the 21st century means scientists and policymakers need to better understand what conditions are likeliest to generate multidecadal droughts, as have occurred in the past. Without comprehensive planning, millions of people dwindling fresh water supplies will threaten millions of people. That very circumstance is already occurring in western Texas where town wells are going dry. An important factor in those cases is energy companies’ use of well water for natural gas drilling. This presents a dilemma more of us will face in the future: do we want cheap energy or cheap water? In the 21st century, both options will not be available at the same time as they were in the 20th century. This presents a radical departure from the past. Categories: drought, environment, global warming, policy, science | Tags: 2012 drought, 2013 drought, climate change, climate policy, extreme drought conditions, multidecadal drought, policy, US Drought Monitor | Permalink. Australia voted last week to scrap their carbon tax and replace it with a much less economically efficient cap-and-trade scheme. The pro-business Reuters article acknowledges the only “positive” that results from this decision: businesses will save money. Well, hallelujah. I’m sure today’s children will be immensely grateful when they’re adults with all the resultant climate change effects that Australian businesses were able to avoid paying for their actions and saved a few billion dollars in the 2010s. That’s one way to look at this news. Let’s flesh the landscape out before throwing Australia under the bus too quickly. To be fair, Australia simply moved up the date when they joined … the European carbon “market”. You remember, that’s the market that severely over-supplied carbon credits at its outset and refused earlier this year to remove some of those excess credits for a mere two years. In essence, the European carbon market doesn’t work. How can you tell? Carbon costs €4.2/tCO2 today. When the European market started, the cost was €31/tCO2. At one-tenth the original price, the market signal is clear: there are far too many allowances in the European market. Have greenhouse gas emissions (note: CO2 isn’t the only GHG!) fallen in the EU since the market’s inception? Yes, but this is a result of the continued economic malaise the Europeans inflict on themselves, as described by the European Environment Agency’s most recent report. The temporary benefit to the earlier Australian move to the EU’s ETS is this: the flow of carbon credits is one way: from Europe to Australia. Australia can’t export credits until July 2018. So in the short-term, Australia could help relieve the over-supply of EU carbon credits. This might help in raising the carbon price back to more realistic levels, but this won’t happen until 2016 at the earliest because of lower emissions and demand for permits in Australia. There are two big negative effects of moving from a fixed tax to a floating market. The first is that carbon will become much cheaper in Australia: from A$25.40 per tonne to A$6 per tonne. Is carbon really only worth A$6? In an over-supplied market, perhaps it is. The fact that not all industries are involved in the carbon market means that we manipulate the true carbon price. Of course, as much as folks like to talk about “free markets”, most markets are heavily manipulated by vested interests. The second negative effect remains local: the move removes A$3.8 billion from the Australian federal budget over four years. Australia’s Prime Minister Kevin Rudd proposed to make up this budget shortfall by “removing a tax concession on the personal use of salary-sacrificed or employer-provided cars.” Good luck with that, Mr. Rudd. Everybody is loath to give up a financial benefit once they receive it. Look – more market manipulation! Australian coal companies were more than happy to propagate misinformation to Australian energy consumers: electricity price increases were due exclusively to the carbon tax! This highlights a common problem with any carbon-pricing scheme: special interests can more easily spread misinformation and disinformation (and are often happy to do so!) than market proponents can spread true information. The reason is often quite simple: the truth is complex and consumers don’t want to invest the time to understand why they pay the prices they pay. How many consumers demanded energy utilities stop raising prices before carbon market inception? Then who was responsible for price increases? “Market forces” is the lame excuse dished out to the masses. How about the relentless, unquenchable hunger for ever-rising profits? Somehow, that’s alright, but accurately pricing a commodity is heresy. An additional piece of context: Australia suffered from record heat waves, droughts, and floods in the past ten years. The Australian public’s acceptance of climate change related to these disasters is widespread, as is their desire to “take action”. Well, the government took action and that same public cried uncle with slightly higher utility bills. This proves the common refrain: people support climate policies … so long as they are absolutely free. That smacks into reality awfully quick. It also demonstrates that there is no such thing as a “Climate Pearl Harbor” that leads to unequivocal support for a given climate policy. The slow-acting nature of climate works strongly against widespread, effective climate policy. Categories: economy, global warming, policy | Tags: Australian carbon market, Australian carbon tax, carbon market, carbon markets, clean energy investment, climate policy, energy policy, ETS, EU Emission Trading Scheme, policy, reserve price | Permalink.